I can help you beat your anxiety, speak with confidence and deliver memorable speeches without being nervous. I offer public workshops, custom corporate training sessions and private 1-on-1 speech coaching. Best of all, I come to you – it’s efficient and convenient. Choose from half-day or full-day workshops. The first is a three-hour small group intensive. We work on speech fundamentals, how to lift your speech off the page and overcoming anxiety. The full day takes what you’ve learned in that first three hours and brings it to bear on your content. What is your message and are you using all the tools to give it, its full impact. And do you really need that slide presentation? (probably not). A customized workshop for your company. I will tailor my coaching to your needs and skill sets of your employees. From a sales team trying to deliver a consistent message over the phone to those employees who must meet the client at their front door. A customized approach will deliver impressive return-on-investment. Whether you’re front line staff or a corporate executive, I can help anyone rise to the next level. Looking for a speaker to knock it out of the park at your next event? 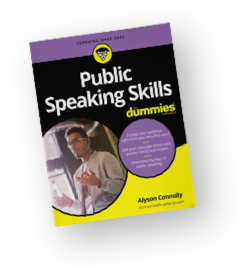 Hire the speaker who wrote the book on public speaking. I’m a vibrant, vivacious performer with the research to back me up. From a start as a child actor to a late life masters degree which brought me to my current vocation. I can bring your event to life with a fun, insightful look at the process of getting up on stage. Are you ready to take your presentation skills to the next level? Improve your ability influence and impact an audience? I will help you become a dynamic, persuasive and engaging speaker. You will command the stage to get your message across and have a lasting impression. I will build on your strengths so that you can become the kind of speaker to command a room and spring the audience to action. Next to dying, people rank public speaking as the most anxiety-inducing experience they have to face. When we suffer from performance anxiety, our body tenses, we take quick short breaths, while our mind bombards us with negative thoughts. I can help you overcome your anxiety and deliver powerful presentations and speeches. You could have the best speech writer in the world write a speech for you, but it’s your delivery that will either inspire your audience or bore them to sleep. I can help you master your delivery. Your accent connects you to your culture and is a part of your uniqueness. But you also don’t want your pronunciation to prevent people from understanding you. You can reduce your accent and make yourself better understood. During one-on-one coaching sessions, I can help you speak more clearly and with confidence. Let’s get started! Call 780-297-0778 or e-mail alyson@alysonconnolly.com.